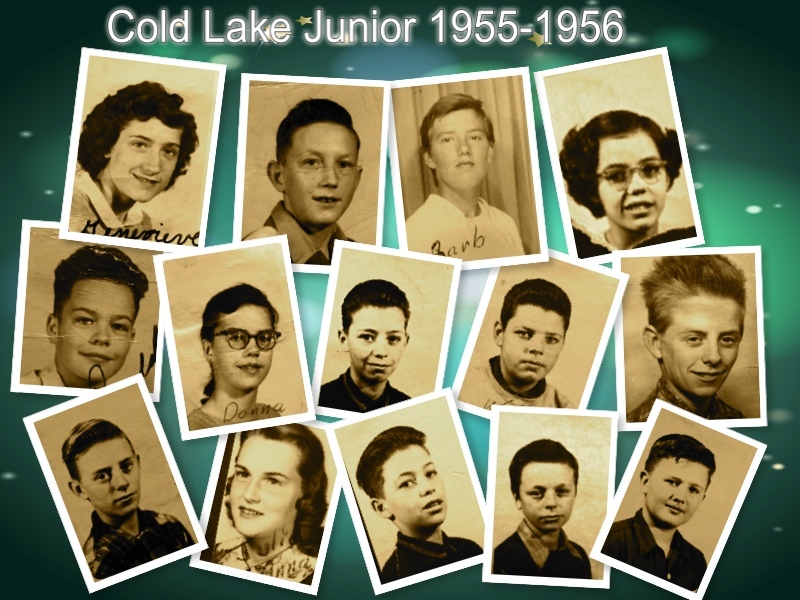 Collage: The above photos provide a small representation of the five years a group of young people spent completing Junior and Senior High in Cold Lake, Alberta. The following story places a context around their world, a world that was becoming vastly different from the one in which their parents and grandparents had spent their teen years. September 1, 2014: Sorry for the delay. Chapter 18 along with about 300 photographs of our High School Years through to graduation, will be posted within the next two weeks. The Silent Generation, a name coined to define those born between 1925 – 1945. While it was applied to those of us who filed into Grade 8 at Cold Lake Junior (photos in the footer) in September 1954, we were so close to the cusp it seems to have missed the mark. Our small group preceded the Baby Boomers by a few years and in the months following graduation, we helped to add a tidy number of Little Boomers to Canada’s rapidly growing population. The Silent Generation! Really? 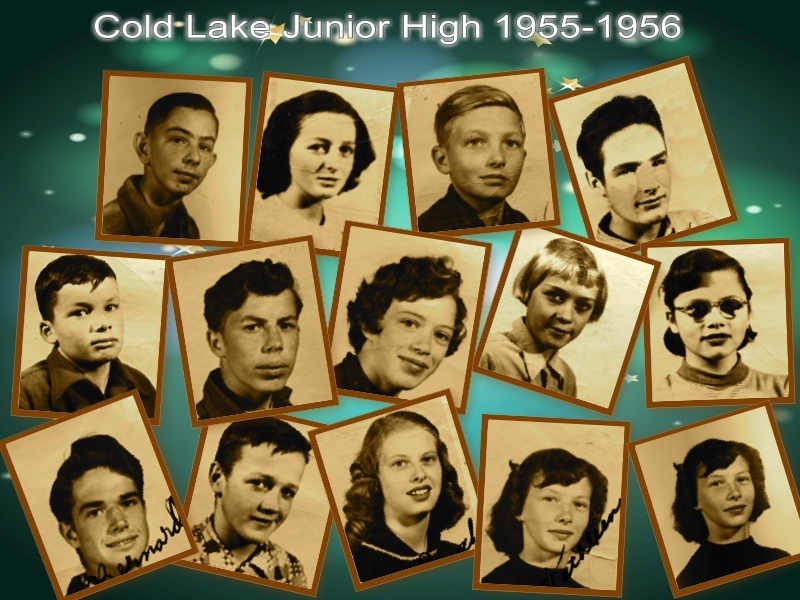 It seems the Time Magazine reporters who defined our group obviously never traveled to Cold Lake High in the late 50’s, nor did they do any first-hand research at those week-end ‘retreats’ at French Bay, English Bay or Marie Lake. For that matter, all they had to do was drop by one of the week-end parties at the Ruggles, Hill’s, Sanregret’s, Poirier’s or any of a dozen other homes when the parents were away. People called us many things, but ‘silent’ ‘grave’ and ‘fatalistic’ were not the adjectives that flowed past their lips. We came of age in a free-spirited time when Rock and Roll became King of the World and Elvis Presley was the King of Kings. It was the Elvis gyrations which taught us that sexuality was not something to be ashamed of or had to be hidden. That fact alone seemed to irritate a sizeable number of the older generation who viewed our lifestyle, dance and dating routines as the beginning of the end of civil society. Ed Sullivan, a popular TV show host of the day, took very public exception to the gyrations of Elvis, so much so that he would not let Elvis appear on the show unless the young man agreed not to gyrate. Elvis reluctantly agreed, but the trend was set and by the time we hit our twenties, we were at the leading edge of a protest movement which would eventually shake North America to its very core (Ref: Counter Culture of 60s). That we did such an excellent job as evidenced in our children who, again for better or worse, continued the trend as they toked, joked and, more importantly, protested their way through the High Schools, Colleges and Universities of the nation. While our parents and grandparents were deserving of immense credit for having saved the world from the tyranny wrought by Germany, Japan, Italy and others, we and our children continued the work of reshaping the world into a much better place than had existed in all history, up to and including the first 45 years of the 20th century. Some may have viewed us as the ‘silent generation’, but we certainly left our mark on the world. With that, I welcome you to this series about the teens who occupied Cold Lake High School during that tumultuous time, those awesome young people who spent a good part of their waking hours trying not to let study intrude too deeply into their social activities. We were an energetic, outgoing generation defined as much by our music as by our grooming. Ducktails held in place with a sizeable dab of Brylcreem, a white sports coat and shoes, or leather jacket and jeans, defined the boys; while the girls toyed with their fancy poodle skirts, bobby sock and elaborately coiffured hair. Almost everyone joined the rock and roll craze that permeated every Junior and Senior High. 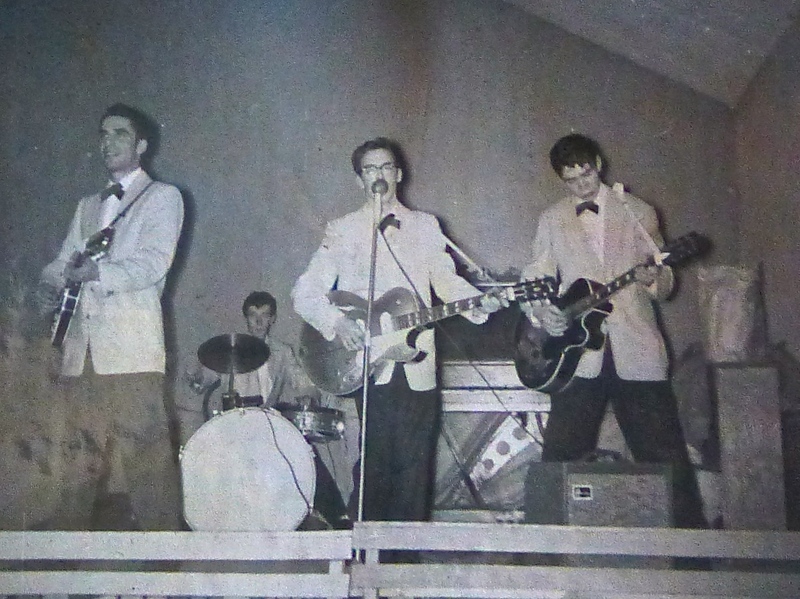 Photo: (L-R) Our very own after-hours rockers featuring Jim Marteneau, Gordie Wusyk (ph) and Billy Martineau who performed regularly at the Tropicana Night Club situated on Highway 28, about three miles south of Grand Centre. The very successful club, owned and operated by the Axani brothers, was the place to be on Friday and Saturday night as they featured a number first-class local and area bands (perhaps someone could name the drummer). We rotated to the Roundel Hotel and other ‘hot spots’ for an after-school soda or coffee with fries and gravy as music pounded from vinyl 45’s in jukeboxes which had remote selectors in every booth. Five cents would buy three songs and twenty-nine cents a pack of Vogue cigarettes. Those cigarettes looked ever so cool when rolled up in the sleeve of a t-shirt and with a thumb and two finger snap, the silver Zippo was on fire. By Grade 8 (if not earlier) many, likely most, of the boys were smoking and although the girls held the line on that particular vice, they managed to generate a number of their own including the use of expletives that had previously been the sole domain of the boys. While they would not dare use those words in front of their parents or other adults, they had no qualms about telling some guy who irritated them or became to aggressive in the back seat, precisely where he could go and how he could get there. Woman were gaining a new confidence that was not about to be suppressed. Remember, this was a time when woman were still second class citizens in many aspects of society. In the job market they earned significantly less than men doing the same work; in Quebec they had only gained the right to vote ten years earlier; in Alberta they could not enter the men’s section of the bar and in Saskatchewan they could not even enter a bar; within the marital relationship, woman had few legal rights and a husband still held the right to physically discipline his wife as well as female domestic help. There were dozens of other ways in which woman was considered second-class citizens and in many ways, they were treated as children needing of ‘guidance’. An excellent movie, Mona Lisa Smile, starring Julia Roberts, zeros in on the challenges faced by a woman in the 1950’s. As for the boys, it now seems evident they were no more willing to accept the status quo than the girls. The era of ‘yes sir, no sir’ was rapidly coming to a close as the millions of young people who began to flood the world were more likely to ask ‘why’ than in any previous generation. It was a trend that would only gain in momentum over the coming twenty-five years. Now back to the carefree side of our teen years. When the A&W set up shop in Grande Centre, it became a favourite pit stop for those with cars and for those without, there were always plenty of offers of a ride. The A&W was the site of my one and only parking lot fistfight – a win for me (my definition of falling softly). Just as we were entering High School and with many boys owning cars, along came every parent’s worst nightmare – a drive-in theatre on Highway 28 between Cold Lake and Grand Centre. More than a few marriage plans were formulated during those weekend double features. As in many small prairie towns, sports – basketball, curling, baseball, softball and hockey – played a large role in community life with our highly successful teams traveling regularly to the neighbouring towns of Fort Kent, Ardmore, Bonnyville, Glendon, St. Paul, Vermilion and points beyond. Those late night return trips from the more distant destinations were the stuff of dreams. How the bus drivers, coaches and parent-teacher escorts survived, I will never know. The people, places and events you will see in the hundreds of photos to be posted over the coming weeks, were copied from a collection meticulously preserved by a High School friend, Guy Venne. Many thanks, Guy for keeping all those photos for well over fifty years, then so graciously providing access to copy and post at will. From these photos will flow a series of short stores of the people and events that defined the Junior and Senior High School years of a small group from the “Silent Generation”. Photo: Guy sits on the diving board at the end of the Cold Lake Dock. 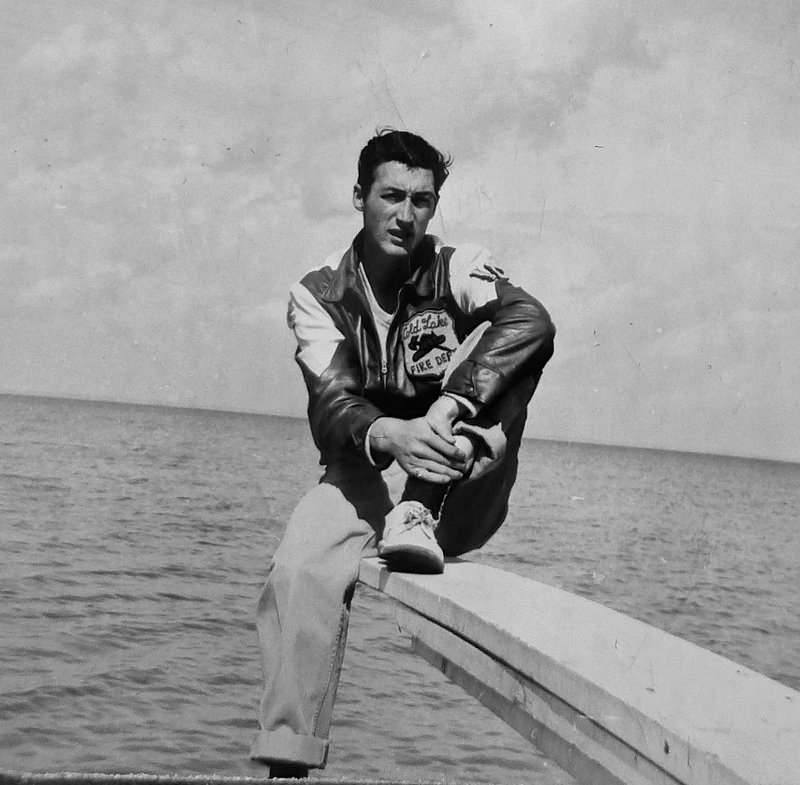 The photo was likely taken in the late 50s as the jacket Guy is wearing signified he was a member of the Cold Lake Volunteer Fire Department. Individual photos will be placed on the McNeill Life Stories Facebook Page with the entries being sorted by grade and year. Names, when known, will be added to each entry. For others, please add missing names. Also, if you have a comment or anecdote about a person or event, please take a moment to add or send in an email. Because it is a family blog…you know. If possible, comments will be used to form part of future stories. You are also encouraged to introduce others to the Blog and Facebook posts so families, friends, children and grandchildren, who may have an interest, can log in and see what the ‘old folks’ looked like and what they were doing in High School. I realize a few High School friends have passed on, but they continue to be a part of our story. There is no better way to keep the memory alive than in photo and story form. If any photo appears on this blog or the Facebook page that you would prefer to be taken off-line, please send me a note and it will be done. Also, if you have any photos of those years and are willing to share, please forward and they will be included in the appropriate collection with credit to your name. For the present, the photos collected have been uploaded ‘as is’ so many are are sepia-toned and some are showing the cracks and crinkles of age. If you have an interest in a particular photo and would like a little work done to recover it, just send me a note on this blog or on the Facebook page where the photo appears. I will pop it into Photoshop and see what can be done. Alert me by email or FB message so the request does not slip by unnoticed. If you do not hear back, I likely missed the message in the first place, so please send me a reminder. As we move forward, please enjoy and remember to take a moment to thank Guy Venne for having preserved these memories for all of us to enjoy. Link here for individual photos included in the collage below. If you are so inclined, click Like on the McNeill Life Stories Facebook Page as that is another means to alert you to future photos being posted as well as new stories on this blog. You may also use the ‘Stay up to Date” feature on the homepage (just under the categories list). You can unsubscribe at any time. Below: The Photos Collages below were built from individual photos provided by Guy Venne. 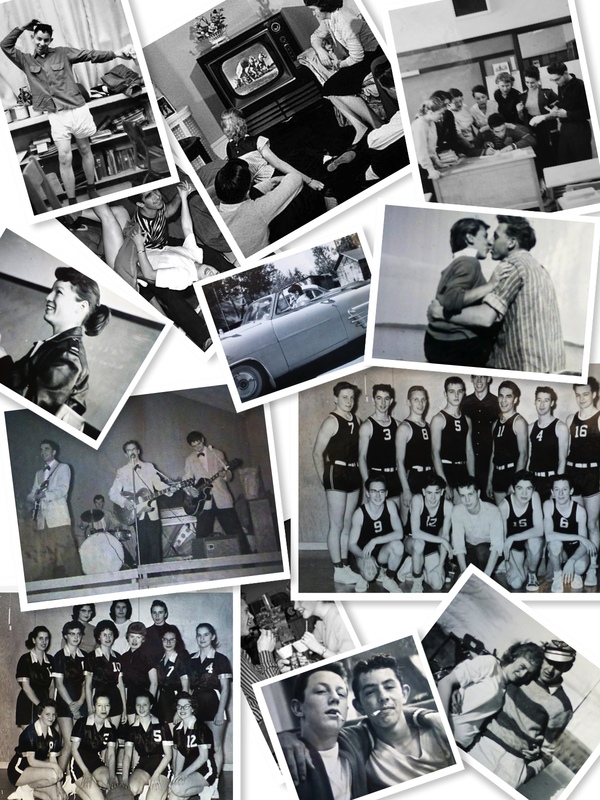 The following three college albums include photos of the 42 students who entered Grade 8 in 1955. Names of the persons in each of the three albums will be added in due course. The individual photos below have been posted on Facebook as noted about. Over the following years, many more young people joined the group as new families moved to the Cold Lake area. Bernard Miron, Paul Lefebvre, Dorthy Hartman, Kathlene Bibeau (Opps) Kathlene twice. Donald Savard, Dawna or Shirley Blackwell (Twins), Ronald Terchinski (?) Wally Armstrong, ???? ?? ?, ??? (girl from Grade 11) Rodney Terchinski, ?? ?, ??? Hey Harold, what you’ve done here is really neat. I love how you describe the times, you described it very well and have brought back many memories to me, some good ones and some not so good. Being born in 1943, I was on the cusp of it, but still was pretty much a part of it all, that was until I quite school to go to work in the adult world. Just the same it’s something I’d like to share with my kids and something to mull over with those I’m still in contact with. I do happen to have a yearbook somewhere of around that time. Thank you for this. Thanks Sis will add his name. The opening comment was also updated. It was the 1961 Honour Roll was it not. Tell Frank that if I missed anything, let me know and I will add it. I’ve gone this far, no use holding back now. 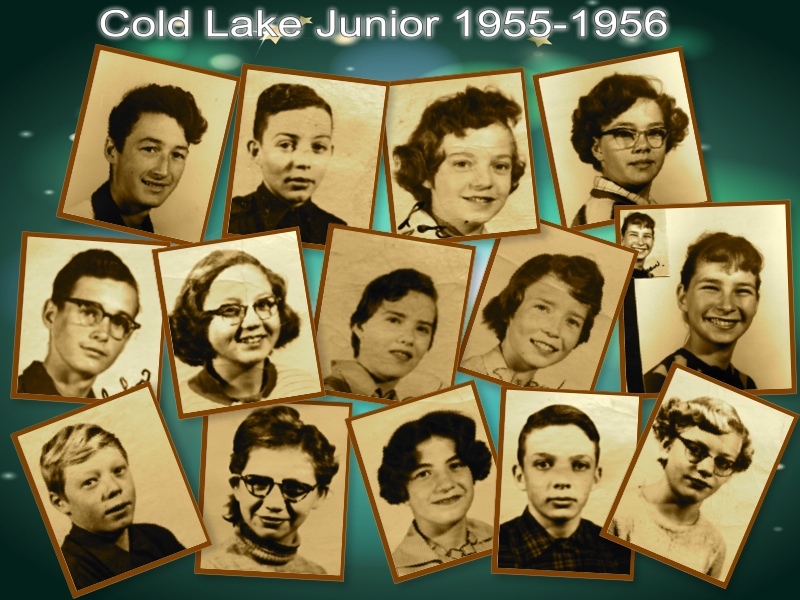 I came across your website a month or two ago while doing some research on Cold Lake History, and have enjoyed travelling back in time with you! I moved here for my nursing career about 9 years ago, and since I’m now raising at least two babies down the street from your old high school, I though it would be good to be able to picture the old town how it was from its inception until now. And now that I’ve started, I can’t stop! It’s fascinating! You paint pictures with your words! Friends of mine just purchased the D&B convenient store that you knew as “Rhyason’s” in your blog, and they want to pay tribute to its history! I’d be interested in what you remember about the old store, if you have memories!